I should say this off the top: I’m not truly acquainted with the Mario Party series. I’ve only dabbled in the modern set of games and never felt the urge to play the classic titles that so many have fallen in love with. When I’m sitting down to play a video game, I’m looking for a tactile, engaged experience—not a digital board game, and the Mario Party series never felt like more than that to me. Yet, here I am, putting more time into Super Mario Party in a week than I did with 9, 10, Island Tour, and Star Rush over the course of several years. I became hooked in a way I didn’t expect to, but that doesn’t mean Super Mario Party isn’t without its major flaws. The first thing I noticed upon beginning Super Mario Party was the game’s stellar production value. From the character models to the environments, everything looks incredibly clean and modern without feeling plastic-y like Super Mario 3D World. 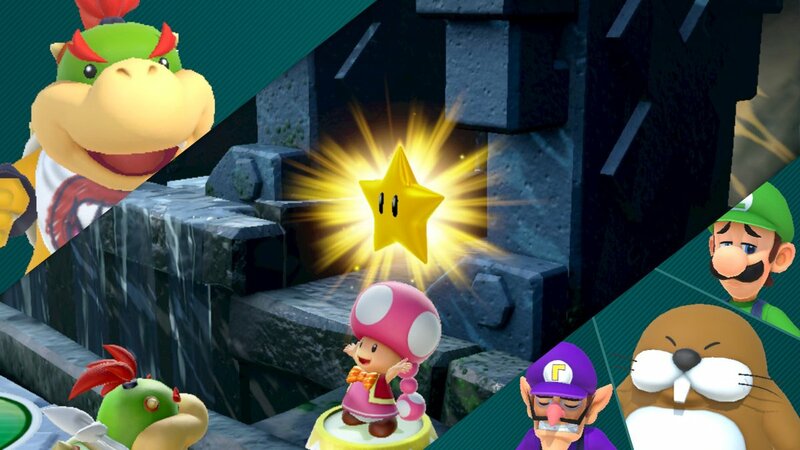 While the game’s creative direction feels decidedly more New Super Mario Bros. than it does Super Mario Odyssey, Super Mario Party bends the “house” Mario style enough to feel fresh. Nothing here felt like a standard “plains” or “beach” locale, and the interweaving of characters and motifs from past titles such as Super Mario 64, Yoshi’s Island, and Super Mario Sunshine lends this game a greater scope that past titles like Mario Party 10 lacked. Super Mario Party also forgoes a traditional menu system, instead, opting for a hub that can be explored akin to that of Nintendo Land. This choice added another layer of cohesion that helped engage me every time I turned on the game. To that effect, Super Mario Party is broken up into many different modes, each with its own gameplay style. The mode where players will spend the lion’s share of their time is Mario Party or its offshoot, Partner Party. Here, you’ll traverse one of four game boards, rolling dice to explore their semi-linear environments with the goal of collecting Power Stars. To do so, you’ll have to buy items, interact with special events, and win mini-games. The Partner variant changes things up slightly, placing players in teams of two and moving them freely along the board in a grid fashion. If you’ve played Mario Party Star Rush on 3DS, this variant will be familiar to you. On the whole, I found these two modes to be absolutely stellar in local multiplayer. Much like the Mario Kart series, Super Mario Party walks the razor’s edge between skill and chance, which keeps the game constantly frantic and enjoyable to players of all skill levels. Traversing the boards and accruing stars is based heavily upon luck; but in a manner similar to a tabletop game like Monopoly. Ultimately, the path around the board and the events that occur are mostly out of the player’s control, but there is just enough agency here that most won’t feel as though the game simply plays itself. I certainly didn’t. Actually, I think that the metered chaos that arises from this randomness serves the overall jovial multiplayer experience. It simply leads to great couch co-op moments, from a vulgar outburst at a Star appearing in a bad location, or a cheer of celebration due to a one-in-a-million dice roll to land on the perfect space. If the boards swing in favor of chance, the minigames swing in favor of skill. After each round of turns, players compete in a mini-game to win coins. This is a bedrock aspect of the Mario Party series, and Super is no exception. Of its 80-game selection, not all are winners, but none truly miss the mark. I didn’t encounter a single one during my time with the game that was a complete dud, although I certainly encountered a handful that weren’t as engaging as the rest. On the whole though, the games exercise unique concepts and control styles, leaning heavily into the Joy-Con’s gimmicks. While this might be a turn-off for some, the ways in which the different aspects of the controller were utilized felt deliberate and immersive. Rarely did I find the motion controls to be shoehorned in, and as a proponent of motion control, I appreciated how well implemented they are. Of course, not every mini-game uses motion control, but it is a big enough cross-section to warrant mention. In addition to adding a dose of skill to the larger Mario Party experience, the mini-games also break up the sometimes-monotonous game flow. My choice of the phrase from before, “metered chaos”, was a purposeful one, as the turns pass at a plodding, set pace, especially when playing with less than four people. In that scenario, Super Mario Party backfills the game with CPU players, as one would hope. However, you have to sit through CPU turns as though they’re human players, which can bring the flow to a screeching halt. Why the CPU’s turns cannot be truncated, removing the aspects only necessary for human players, is beyond me. Likewise baffling, are the modes’ restrictive turn counters, allowing players to only choose from ten, fifteen or twenty-turn games. Considering a ten-turn game lasts about an hour, custom turn counters for shorter matches would be greatly appreciated. Unfortunately, this restrictive design philosophy is emblematic of the rest of Super Mario Party in its near totality. It is rather paradoxical in fact, as Super Mario Party has quite a bit of content outside its main attraction, but based on the way that content is parceled out, it doesn’t feel that way. All of the side modes from the co-op River Survival mission, to the short-form mini-game challenges, just feel cripplingly limited. Take, for instance, River Survival, a particularly novel idea in which four players work together to raft a branching river full of hazards and mini-games. This mode gets tiring after just a few runs due to the fact only ten of the mini-games are compatible with it—and mini-games are integral to reaching the mode’s conclusion as they put more time on the ever-depleting clock. Playing the same mini-games over and over, even though they’re rather good, just becomes monotonous. If two teams of two, instead of one team of four, could compete in a rafting race to the bottom of the river, this would not only open up far more mini-game opportunities, but also offer a new take on the concept. But, the developers did not take that step, or really any steps like it. This lack of options extend to the mini-game modes which are just as, if not more limited, than River Survival. Take, for instance, the Mariothon mode. This is a simple mode in which players compete in a series of five games, and the winner is the player with the most points at the end. Sounds malleable enough, right? Well, in practice, only fifteen or so games can be played in this mode. The fact that you cannot choose any five mini-games from the entire lineup for Mariothon says a lot about how restrictive Super Mario Party can feel. Somehow, online play fares even worse than the offline mini-game challenges. Should you choose to play online, you’ll only be able to play less than 25% of the title’s mini-games in a rotation, similar to Splatoon 2’s map cycle. This is such a sorry attempt at online play that I’m surprised the developers even included it. Forget even full-board support (which should be a feature with friends, mind you), simply putting all 80 mini-games online should’ve been the minimum. There is absolutely no reason to play the online mode for longer than a few minutes, which is a crying shame—especially in the post-Online Service climate. That isn’t to say the game isn’t worth playing, though. If you have some friends or family members willing to play Super Mario Party with you, this is a no-brainer in my book—just temper your expectations. I think that the fun factor alone justifies the price of admission: the sheer amount of chaos, laughter, and arguments that have been sparked by Super Mario Party in the short week I’ve had the game has left me with an overall positive impression, and I’d imagine others would share the sentiment. Again though, this is from the perspective of local multiplayer. For solo players, I would certainly wait on this one. Surprisingly, Super Mario Party does feature a high-quality campaign called Challenge Road, in which you explore different regions playing mini-games with certain victory parameters, but that alone isn’t going to justify the purchase. Even Mario Party and Partner Party, while easily the best parts of the game, really do require others to fully enjoy. Considering how much fun I had with the game, I wanted to be able to render a fully positive verdict. But, there was always a voice in the back of my mind that was frustrated by the odd limitations imposed in Super Mario Party. Frankly, I would’ve liked to see Nintendo shelf ideas like River Survival and Online play entirely, instead putting those resources into making the core modes even better. With just a few more boards and better quality of life, Mario Party and Partner Party could’ve been strong enough and robust enough to hold up the rest of the content, but they fall just short of that mark. When you compound that with the half-hearted side modes, the wealth of content and down-the-road replayability are thrown into question. If I could score the game based on its fun factor alone, Super Mario Party would be pushing a high eight or a nine. But, I have to consider the entire package, and between the restrictive design philosophy, laughable online mode, and sometimes plodding pace in Mario Party, I just can’t justify that high a rating. Super Mario Party is some of the most fun to be had with a local multiplayer game on the Switch. Unfortunately that is compromised by a deluge of limited modes and design decisions that pull the whole package down. Based the fun factor alone, Super Mario Party justifies its price tag for anyone looking for a new game to play with friends. However, Super Mario Party's fun factor well exceeds the title's fundamental design principles--so tempering one's expectations is a must. Abram is an aspiring games journalist with a soft-spot for titles published by a particular company that starts with N, and ends with -intendo. When he's not playing, or writing about, video games, Abram is most likely ranting to no one in particular about various films he's seen, or grabbing the sketchpad to do a bit of drawing.